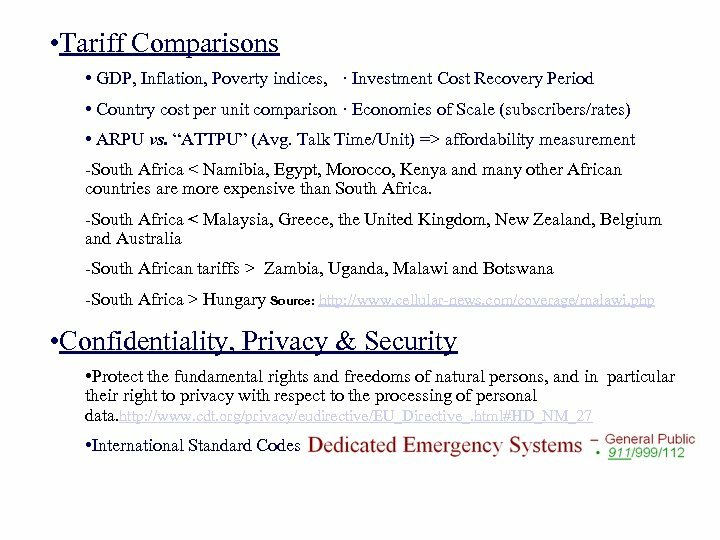 • Quality of Service • ITU developed for FTOs benchmarks indicators such as: - • • GSM: What equivalent indicators? e. g : - • • SMS delivery • Network Failures • Access to Customer Care • Complaints. . 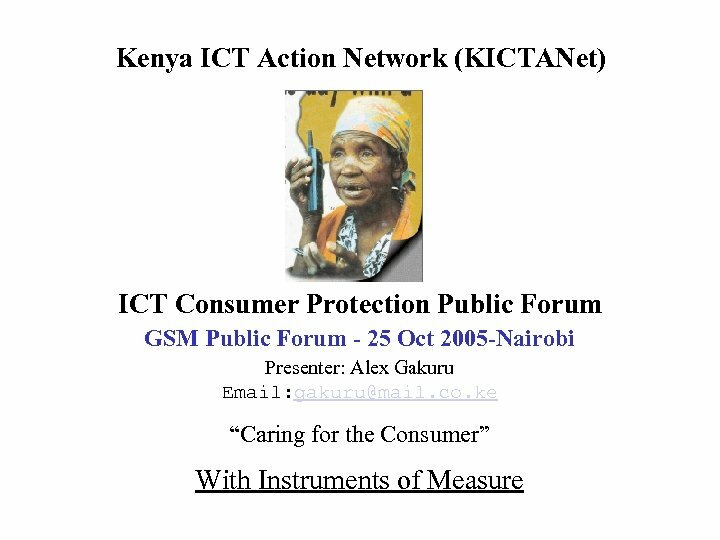 Benchmark Consumer Awareness? 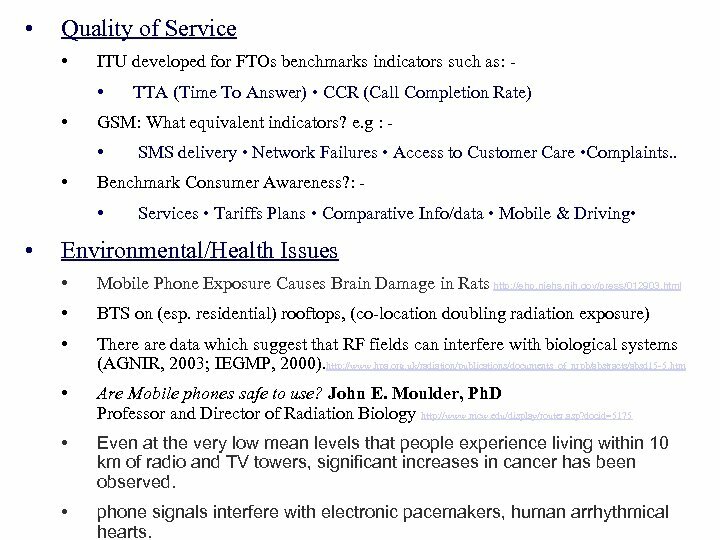 : - • • TTA (Time To Answer) • CCR (Call Completion Rate) Services • Tariffs Plans • Comparative Info/data • Mobile & Driving • Environmental/Health Issues • Mobile Phone Exposure Causes Brain Damage in Rats http: //ehp. niehs. nih. gov/press/012903. html • BTS on (esp. residential) rooftops, (co-location doubling radiation exposure) • There are data which suggest that RF fields can interfere with biological systems (AGNIR, 2003; IEGMP, 2000). http: //www. hpa. org. 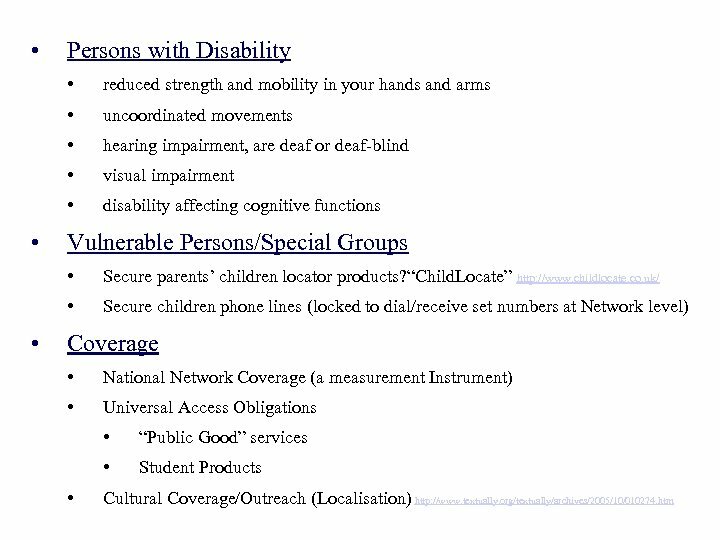 uk/radiation/publications/documents_of_nrpb/abstracts/absd 15 -5. htm • Are Mobile phones safe to use? John E. Moulder, Ph. D Professor and Director of Radiation Biology http: //www. mcw. edu/display/router. asp? docid=5175 • Even at the very low mean levels that people experience living within 10 km of radio and TV towers, significant increases in cancer has been observed. • phone signals interfere with electronic pacemakers, human arrhythmical hearts. Hello… thank you for listening to me.